2K Games has announced that the BioShock 2 DLC Protector Trials and Minerva's Den will be coming to the PC after all - and Protector Trials will be a freebie. 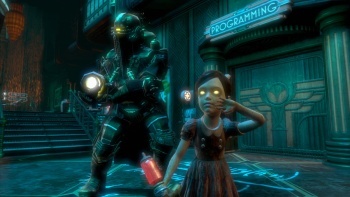 When 2K announced a few weeks back that "technical and timing issues" had brought a halt to work on the PC versions of the Protector Trials and Minerva's Den DLC for BioShock 2, it did not go over well. Even worse was the decision, revealed at the same time, to kill a long-awaited patch intended to correct several outstanding glitches in the game. Long-suffering PC gamers howled their outrage over this latest barb under their skin, furious with the publisher for abandoning the platform. And then something interesting happened. 2K listened. "I have some good news concerning the BioShock 2 PC patch as well as the development of Protector Trials and Minerva's Den for the PC. Not to keep you in suspense any longer, I'll sum it up with one sentence: We have resumed development on all three and they will be coming to PC," 2K Senior Marketing Manager Elizabeth Tobey wrote in a message on the BioShock forums. According to Tobey, 2K was simply unable to get any of the three updates ready for prime time before the mandated end of the development cycle and so it made the perfectly sensible decision to pull the plug and move on. But the rage that followed caught everyone off-guard and thus, second thoughts ensued. "We are a company of gamers making awesome experiences for gamers - and given the conversations we've had over the past two weeks, we've decided to go back and finish the PC patch and Protector Trials," Tobey wrote. "Currently, we are patching the final bugs in these two pieces of content and then will submit everything to certification. The cert process can take anywhere up to four weeks, but as we hit major milestones (passing cert or otherwise included) I'll tell you guys. We are projecting that the patch and the Protector Trials will be ready to cert in December and I'm happy to announce that they will be available free to the community." Minerva's Den is in a different situation and PC gamers will have to wait a bit longer for that one. "When we stopped development on Minerva's Den, it was not in a workable state and needed significantly more dev time to complete," Tobey explained. "As of now, we are not certain how much longer it would take to complete the project to our standards, but we have reallocated resources to work on completing the project so PC gamers can have this experience in Rapture along with 360 and PS3 owners." "Often, development is not a smooth and straight forward path. We never want to disappoint our gamers and we will always listen to what you have to say and try to do what's right for you and the game," she continued. "I want to thank all of you not only for your feedback, but also for your patience and understanding." And who says that complaining on the internet never accomplishes anything?